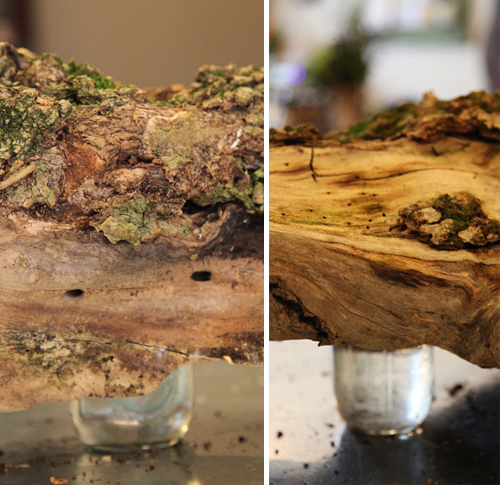 The openings in your log, (big enough to put your arm in) are essential, as that is where you will place containers to hold your flowers. To begin, Laura used leftover plastic food bowls and filled them with Oasis floral foam. 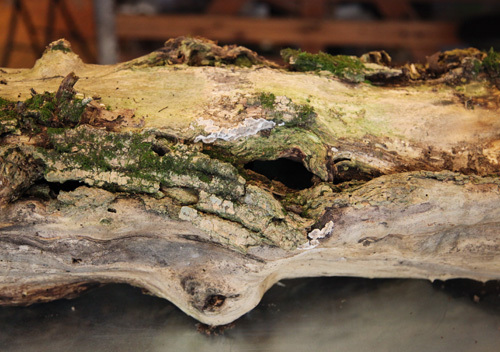 She then wrapped it in Aspidistra leaves to conceal and placed inside the log. Once you have your containers set, you can build your mini garden masterpiece. 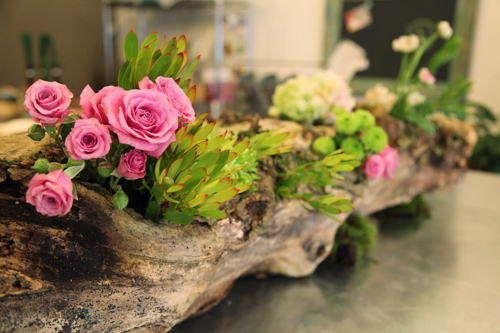 For this log, Laura added pretty ranunculus with color variations from cream to pink to burgandy. 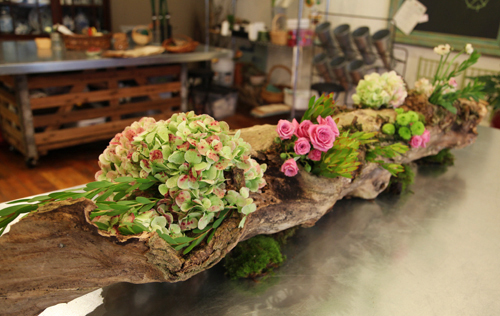 Then she selected flowers to accent those colors, like these beautiful Antique Green Hydrangea. They also work well for this as they dry nicely. 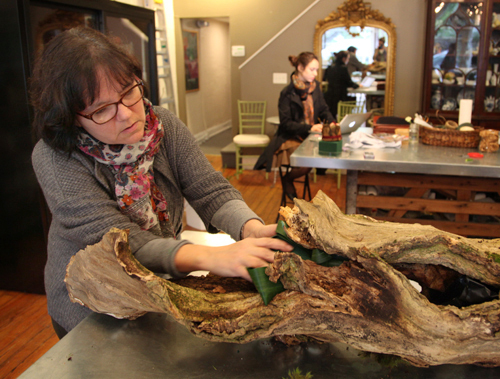 Laura then grabbed Leucadendrom, one of her favorite stems as it is long lasting and adds interesting texture. 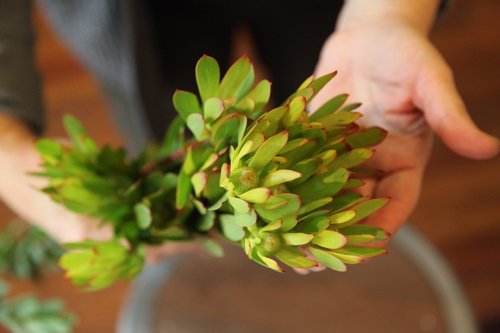 As Laura shared, "Leucadendron continues to open for weeks, eventually revealing a pine cone in its center." 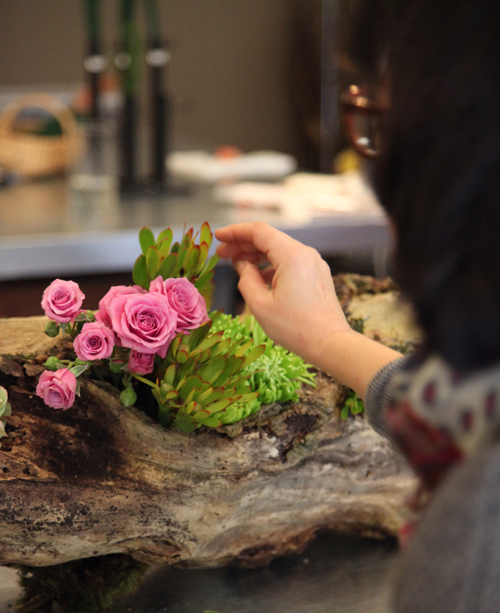 Lastly, Laura added pink spray roses, which are more delicate but can be easily replaced. 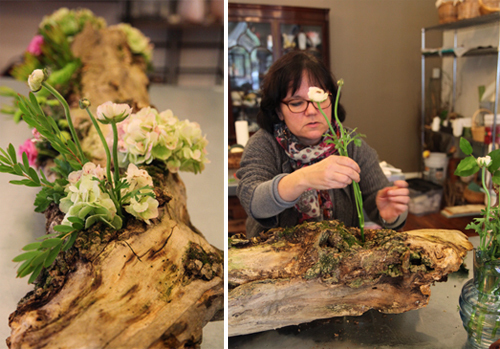 Laura found inspiration for this log from Gudrun Cotteniere, owner and founder of the largest flower school in Belgium. Gudrun had participated in a workshop with Laura and ever since then, Laura has taken a group once a year to Belgium and the Netherlands to study with her, as well as other designers. 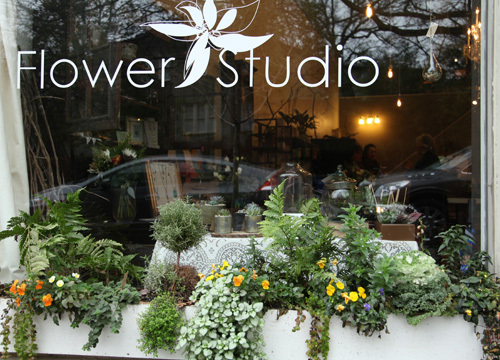 Learn more about Laura's trips, classes and recent floral creations on her site or stop by her lovely shop in the Highlands section of Atlanta. Thank you Laura! Laura will be hosting a free demo at our Sweet Peach Revival: Terrarium Building 101 3pm on Saturday, July 6 at the Belly General Store. Please come! Learn more about the Revival here.